The MSH jobs board is available for a fee of $50 per job to all employers. Payment options include credit card, debit card, Pay Pal or check. Once payment is received positions will be listed for 3 months. This scholarship has been established to honor, past-president, Pat Donner and her lifelong commitment to Histology Education. The scholarship is to be used to pay the ASCP(BOR) fees for 2 eligible HT or HTL candidates each year until the funds are exhausted. Graduate of NAACLS approved Histology program. ASCP(BOR) exam must be taken within 6 months of graduation. The recipients will be selected in a blind draw from all eligible candidates. The award will be given on a reimbursement basis. This award has been developed to honor the MSH founders who believed that education of our members is vital to the growth of our profession. Nominate someone for the Founders Award by "Registering"
To be eligible you must be an active MSH member, but not an MSH Board member or student. Award: $350 on a reimbursement basis, to be used for any form of histology education (seminars, workshops, books, teleconferences, etc.). Funds will be available to the award winner for two years. Winner will be chosen by lottery from all qualified nominees and will be announced at the Annual Symposium. Presented to an individual who contributes significantly to the field of histotechnology in Michigan. Nominate someone for the Budinger Award by "Registering"
The nominee for this award does not need not be a Michigan Society of Histotechnologists member. The coveted award consists of recognition with a plaque and a $50.00 check. Presented to the author of an original paper, or to the presenter of a workshop/ lecture, that is pertinent to histology. 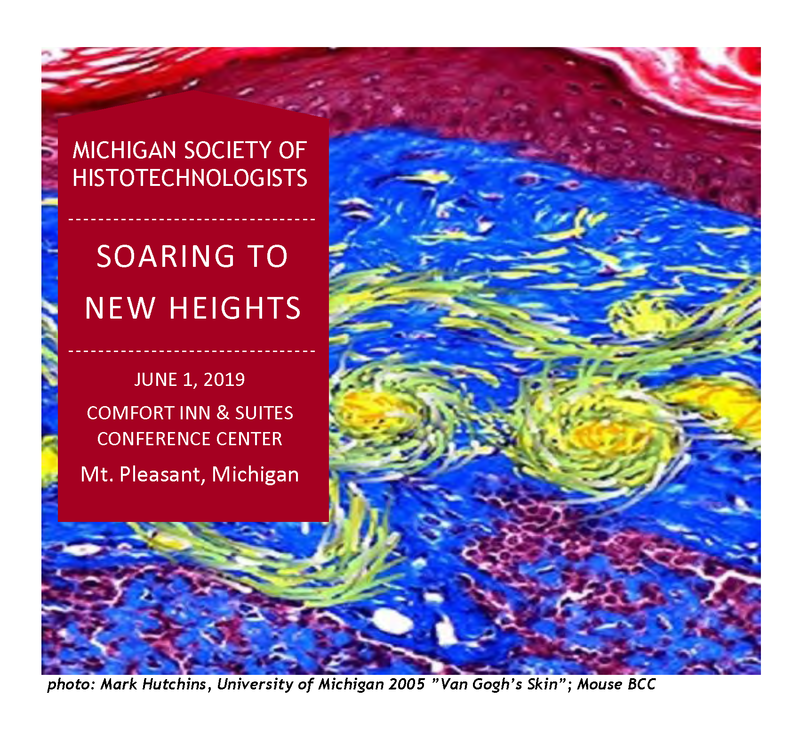 Nominate someone for the Spillan Award by "Registering"
Nominee must be a current member of the Michigan Society of Histotechnologists. The award consists of a plaque and a $50.00 check. Can’t attend in person? Be a virtual attendee! Choose to attend online and live stream from wherever you are! Full details on accessing the webcast along with any associated handouts will be emailed to you approximately 5-7 days before the program. RESERVATIONS: 989-772-4000. Rooms are limited at the Comfort Inn! Mention “MSH2019” to receive the MSH Symposium group rate of $129. Early Bird Special! Register on or before May 25th, save $40!